Linton Quarry is owned by Linton Parish Council. 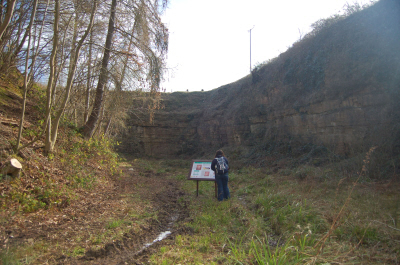 Linton Quarry is one of a series of quarries found in the village of Gorsley. Quarrying here finished during the early 20th century and the site was then used as a sawmill. Since commercial activities finished within the quarry it has become a wildlife haven. It is a geological Site of Special Scientific Interest (SSSI). The geology of Linton Quarry dates to the Silurian period of time and spans in age from 428 million years ago to 416 million years ago. The Quarry contains the most accessible and best-documented Silurian aged rocks in the area, and hence is not only unique but also very important to the geological community. Further information is available from: Earth Heritage Trust, and Natural England’s citation. The Parish Council is always keen to hear from volunteers who would be willing to help keep the quarry managed to allow access to visitors. Please contact the Clerk in the first place.